SACRAMENTO – Sutter Medical Center, Sacramento is the first hospital in the Sacramento area to enhance patient safety by deploying a Xenex Germ-Zapping Robot™ to battle the germs and bacteria that put patients at risk. Patricia Mullins, Sutter Medical Center, Sacramento EVS UV Tech, demonstrates how the new Xenex robot named Xhaiden I works in disinfecting rooms. The comprehensive medical center in midtown Sacramento already posts an infection rate that is lower than the state and national averages, but officials acquired the robot in their quest to wipe out hospital-acquired infections altogether. The Xenex robot has been proven through scientific studies to destroy hard-to-kill superbugs – such as multi-drug resistant organisms like C. diff and MRSA – in hard-to-clean places. 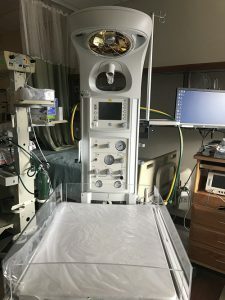 Sutter Amador Hospital started using new Panda Warmers and wireless monitoring systems in the Family Birth Center thanks to generous community support and the proceeds from the Sutter Amador Foundation’s annual theme ball last fall. The Panda Warmers provide thermoregulation in a quiet and stress free environment for new moms by eliminating nuisance alarms and providing easily controlled light levels. The state-of-the-art warmer technology bathes the newborn in soothing warmth while keeping moms and caregivers cool and comfortable. They also feature a scale, heart rate and SpO2 monitors.